Lyndon James led from the front with a rapid-fire half-century as the Nottinghamshire 2nd XI cruised to victory over Northamptonshire’s 2nd XI at Lady Bay. The 2nd XI skipper smashed 73 runs off 64 balls as the hosts’ total of 340-9 from their 50 overs proved far too much for Northants, who were bowled out 159 runs short. 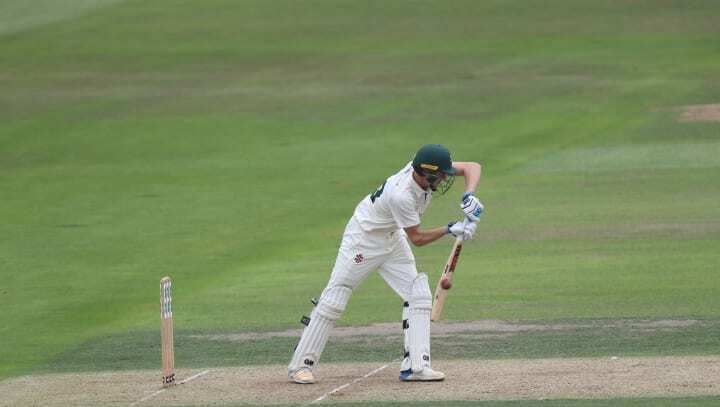 James shared in a near-century stand with Liam Patterson-White, who followed up a century for the Notts Academy earlier this week with 43 off 38 balls before being dismissed with the score on 98. Jake Libby, another recent centurion for the Academy, kept up the momentum by scoring 68 at almost a run a ball, before he, like Patterson-White, was dismissed by Tom Sole. Sol Budinger, Chris Gibson and Joey Evison weren’t able to significantly trouble the scorers, but Zak Chappell’s 33 from 29 balls soon had the seconds back on track. After Chappell’s departure, Matt Carter bludgeoned the Northants attack, hitting an unbeaten 64 from just 31 balls in which he cleared the ropes five times. Sam Hall and Jack Blatherwick (both 13) kept Carter company as Notts reached 340 from their allotted overs. Nick Kimber (4-36) wasted no time in getting stuck into the Northants top order as they began their chase, removing Richard Levi (3), Saif Zaib (9) and Charlie Thurston (10) in his opening three overs. The 18-year-old then took his and Nottinghamshire’s fourth of the game, athletically removing Emilio Gay, caught-and-bowled for 16. Liam Patterson-White castled Graeme White for 2 before Matt Carter continued a fine all-round performance by dismissing Tom Sole for 4. Chris Gibson’s leg-breaks then accounted for Ben Claydon, who had been playing nicely for his 33, and Harry Gouldstone (3). At 156-8, the writing had long been on the wall for Northants, and the result of the game was left in no doubt when Ben Curran finally fell, the opener being bowled by Carter for 76. The last wicket pairing of Ben Kitt and Jack Twigger held out for two overs before Twigger was caught-and-bowled by Patterson-White for 4, meaning Northants were bowled out for 181 with almost 17 overs to spare.